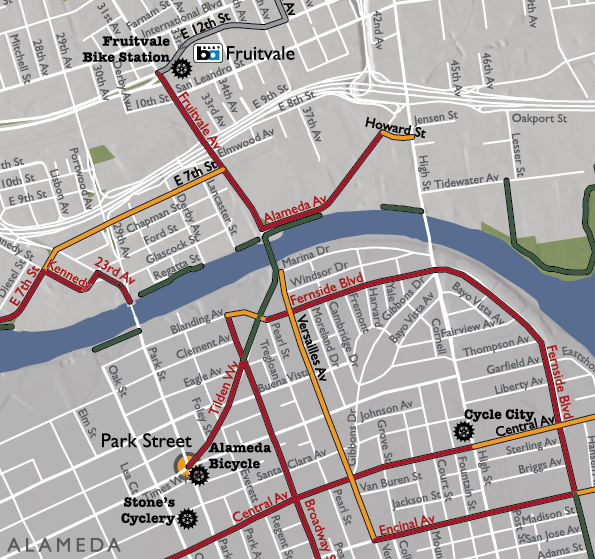 May is Bike Month, and the Oakland Bicycle and Pedestrian Facilities Program is pleased to roll out the first-ever free map of Oakland bikeways. 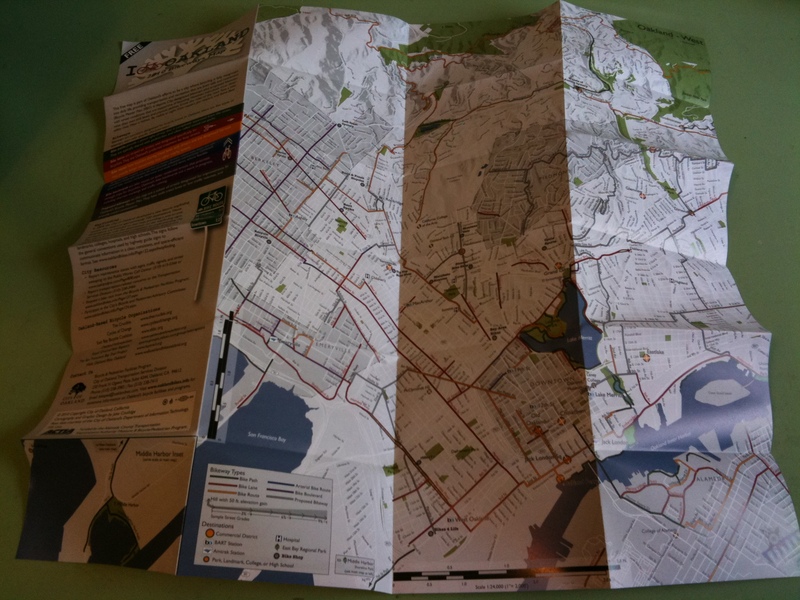 With an initial print run numbering over 10,000, we’ll be distributing the map at bike shops throughout Oakland and in grab bags on Bike to Work Day, this Thursday, May 13th. 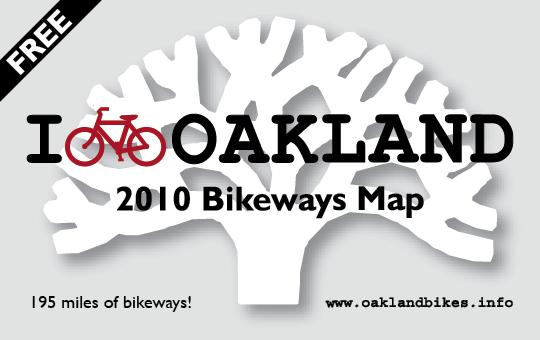 Come see us Thursday morning at Oakland City Hall Plaza, grab a stack of pancakes, and pick up your own copy of the map. 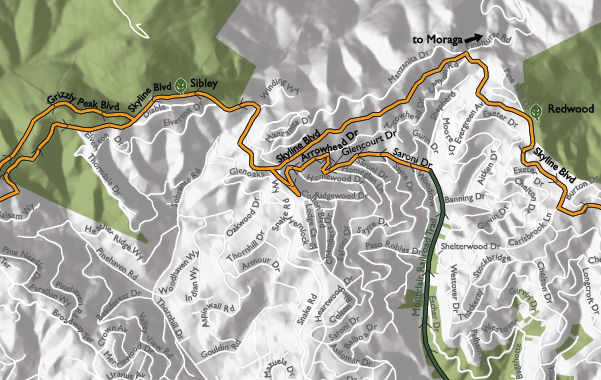 Learn more about this year’s Bike to Work Day festivities here and download a pdf version of the map from this page. 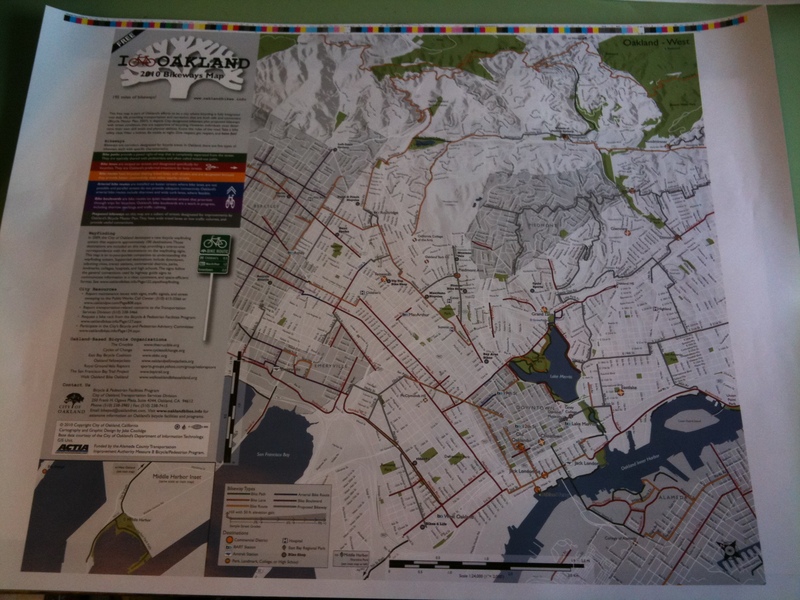 This is the first map I’ve designed to be professionally printed and folded, and I’m quite pleased with the outcome, to say the least. You have to hold one in your hands to get the full effect, but I’ve attempted to document some elements of its design and the end product below. 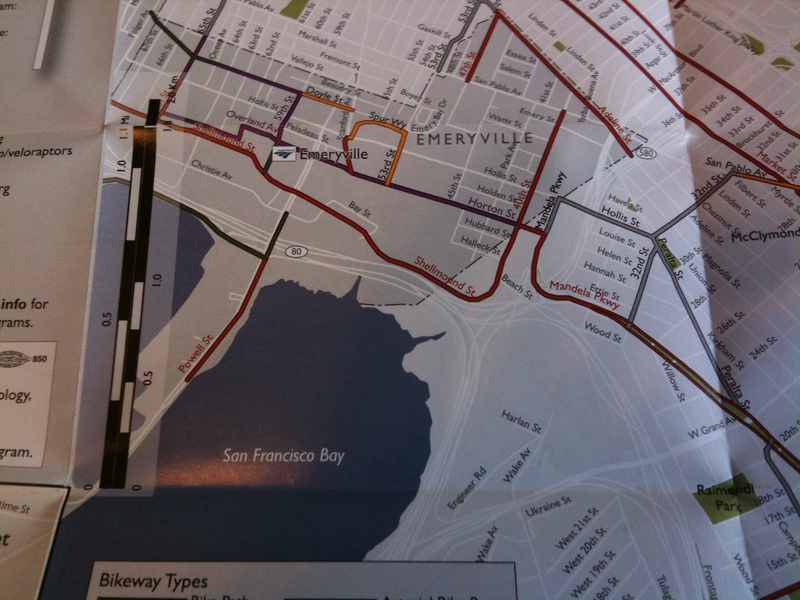 My supervisor, Jason, instigated the project, and having pored over many bikemaps himself over the years, had some early layout ideas that provided me with a good starting point. 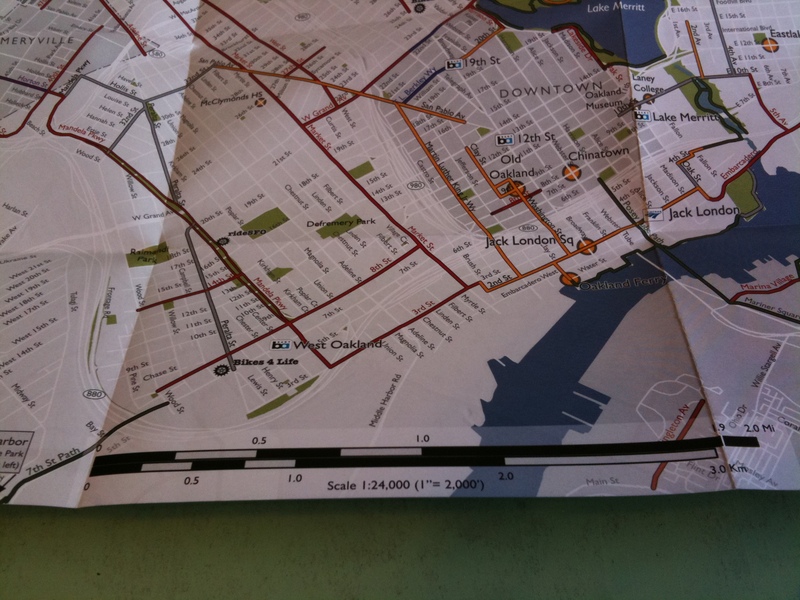 My other supervisor, Jennifer, assisted with some of the non-map layout and secured the contract with the printer. 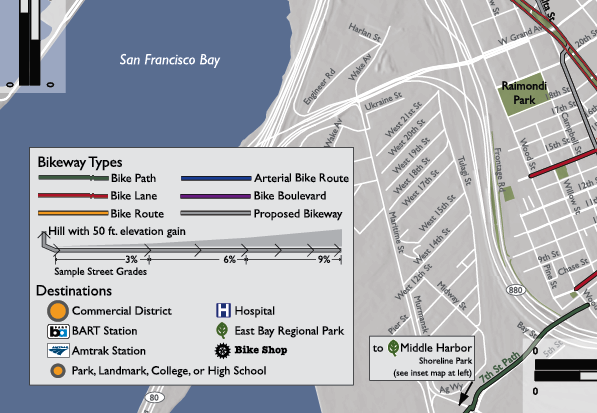 Both provided crucial feedback during the design process, as did the Oakland Bicycle and Pedestrian Advisory Committee, the San Francisco Bay Trail Project and Bike/Ped programs in Berkeley and Emeryville. 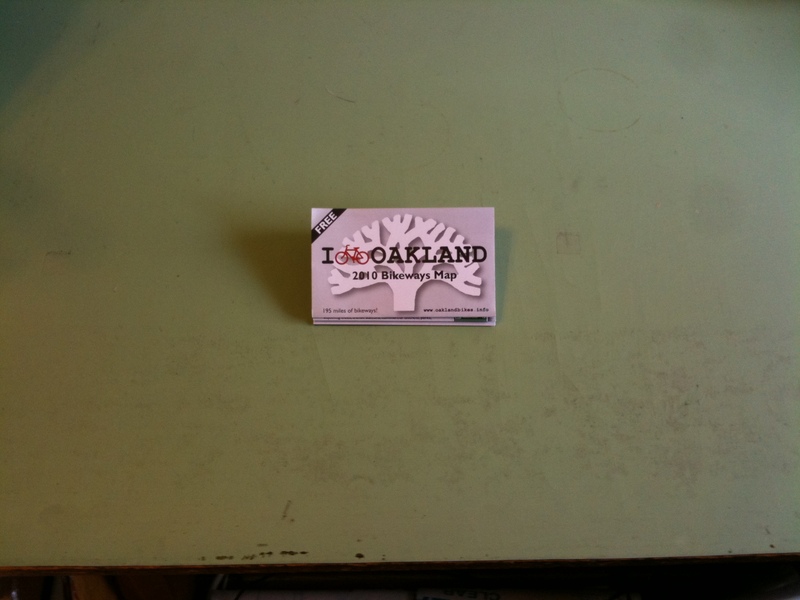 Finally, the staff at Lithographic Reproductions, Inc. were terrific. 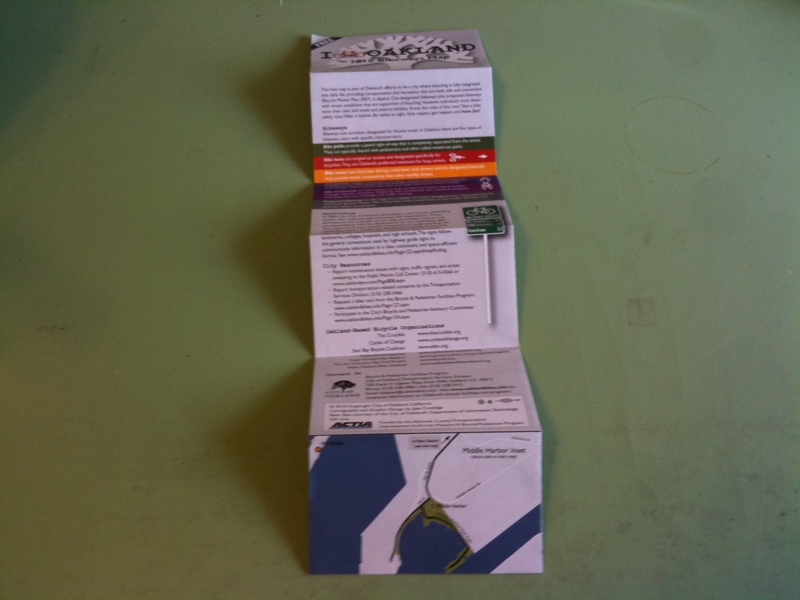 The map measures 3″ x 5″ when folded: very pocket-compatible. 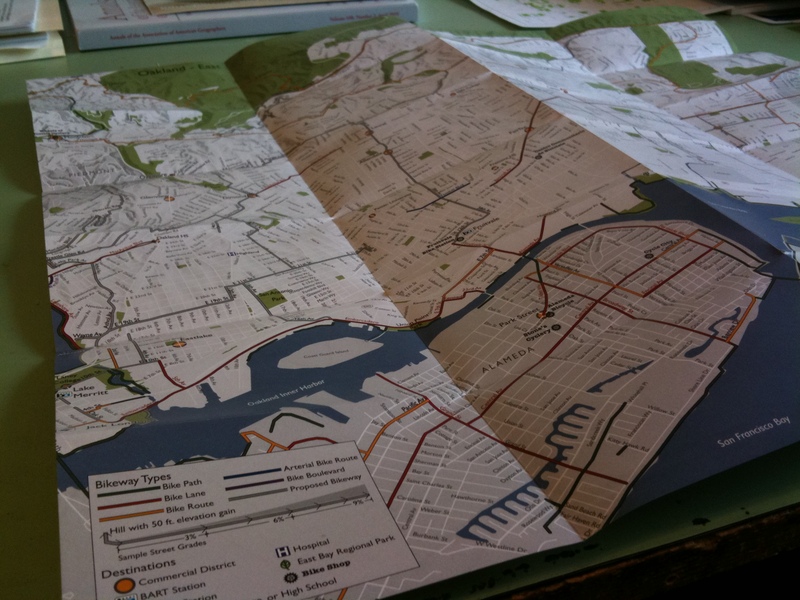 Unfolding the map first reveals a word from the program explaining the types of bikeways found on the map and the network of destinations supported by our wayfinding sign system. 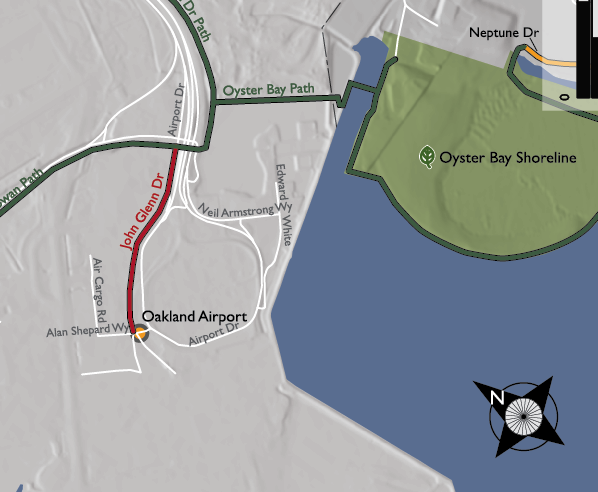 Fully unfolded, the map extent includes Berkeley and Emeryville on the left, spanning to the Eastlake neighborhood on the right (the map has been rotated 50 degrees, so that North points up and to the left). 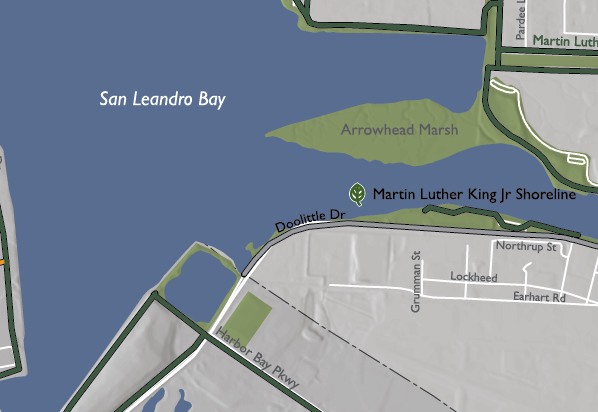 The city continues on the other side of the map, from Eastlake to San Leandro. 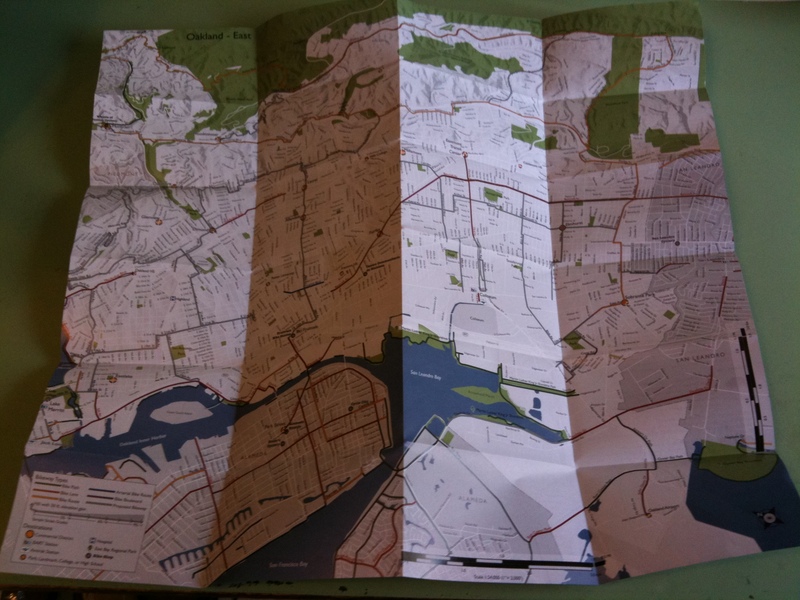 The right-most 5 inches on one side overlap the left-most 5 inches on the other side, to reduce having to flip the map over. The map scale is 1:24,000. At this scale, 5″ is apx 1.9 mi, and 3″ is apx 1.1 mi. 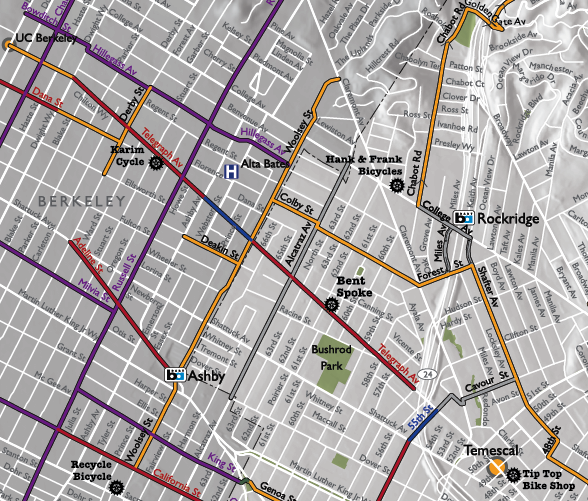 With my scale bars, I call attention to this, so the map viewer can use the folds of the map to quickly estimate cross-town distances. 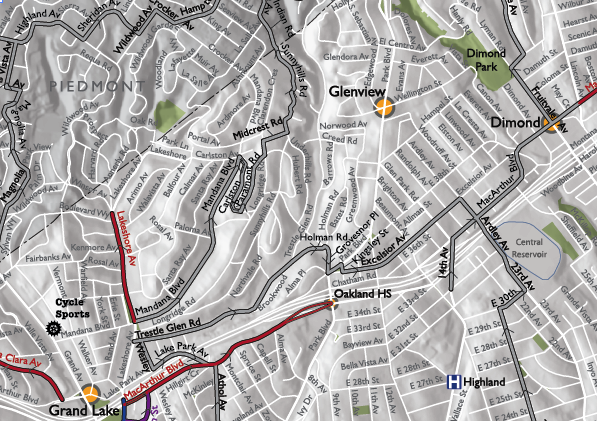 I don’t think I’ve seen this on a map before, and I’m curious if cyclists will make use of this feature. And yes, I included a metric scale as well. thank you so much! 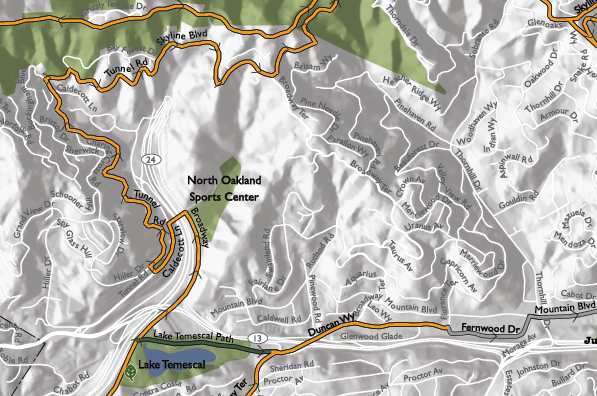 i love the arrows indicating elevation change, very clever. Awesome – I want one! These are beautiful! 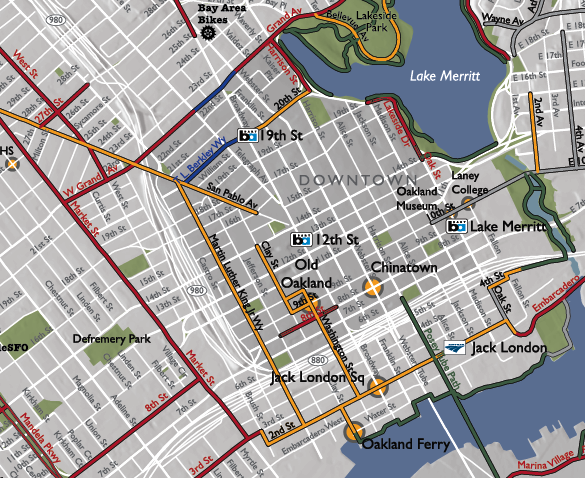 Wish SF had such a classy and colorful hi-res map to call our own. (Seriously, it’s better than ours.) Nice job, Jake! 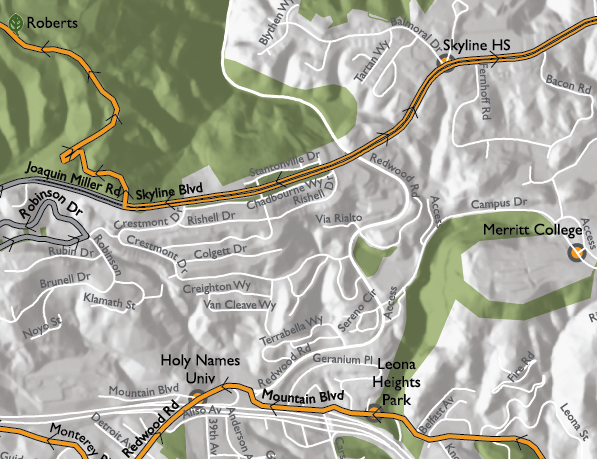 Beautiful map! 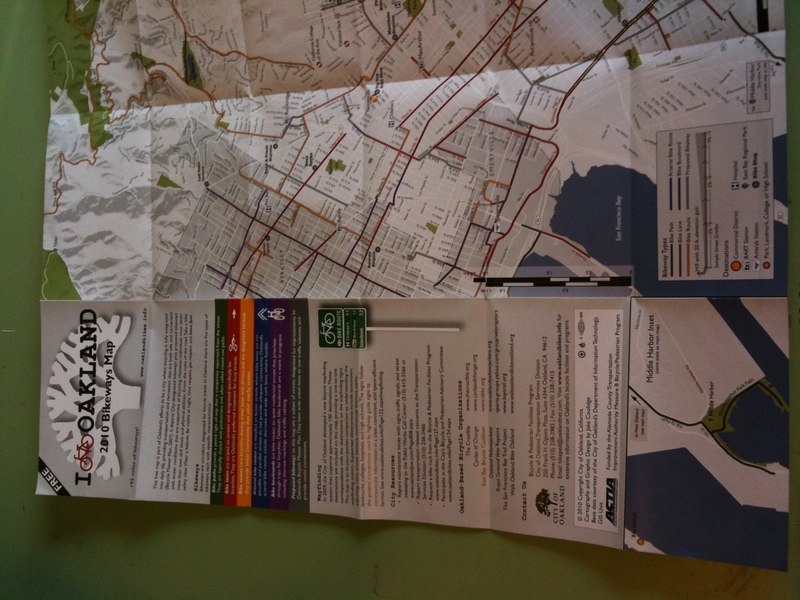 Your scale with the map folding idea is ingenious! Much better than the tiny, off-to-the-corner scales! Wow Jake. Wow. Your work is awesome. So well thought-out and user friendly. A great effort. Congrats to you!! Yay Jake! !